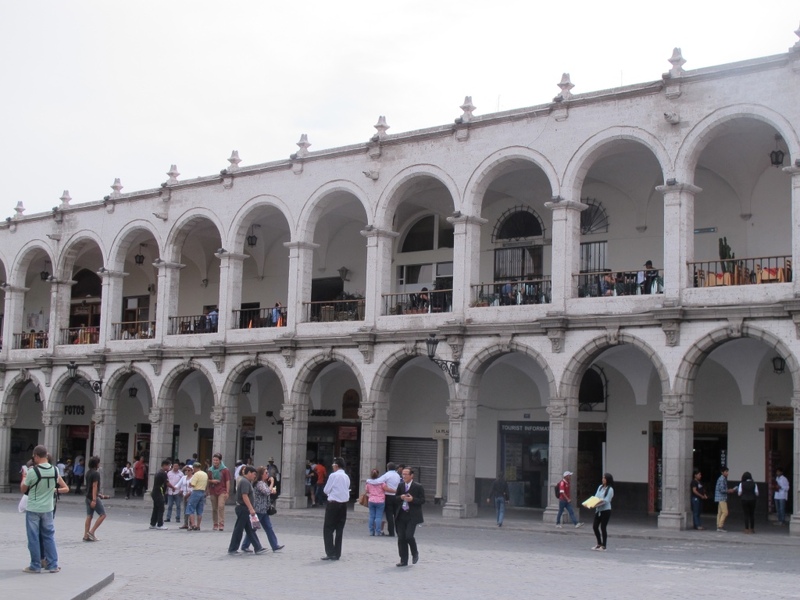 The Spoked Traveller | Arequipa! It’s odd. I actually don’t know what time of the year it is. 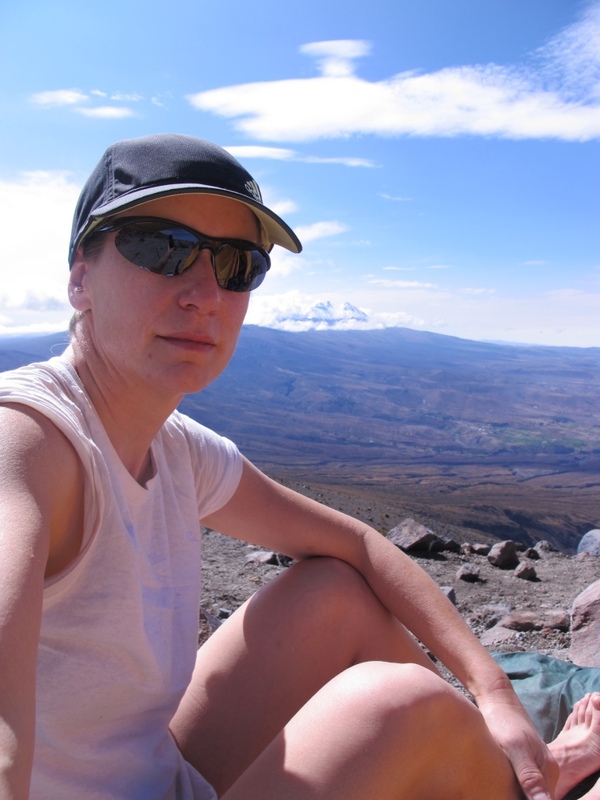 Doesn’t feel like February since I’m shedding skin like a snake in odd patches on my neck and calves–missed sun block– and yet, I cannot associate it with my idea of summer: hiking canyons and volcanos, I’ve had to wear mitts, hats and even a down vest, to bed. It’s a Peruvian summer. That’s what it is. And it also marks the end of my first, of six months, in Peru. Hiking along the River Chili in centre of Arequipa. For once in my life, I didn’t feel guilty or remorseful for not finishing something. I think a few years ago I would have forced myself up that mountain, crapping the entire way just to prove something. Pride? Dunno. But as I rolled over and went back to sleep, I felt at peace with my decision. And, weeks later, I’m still happy I didn’t cave. With age does come wisdom. 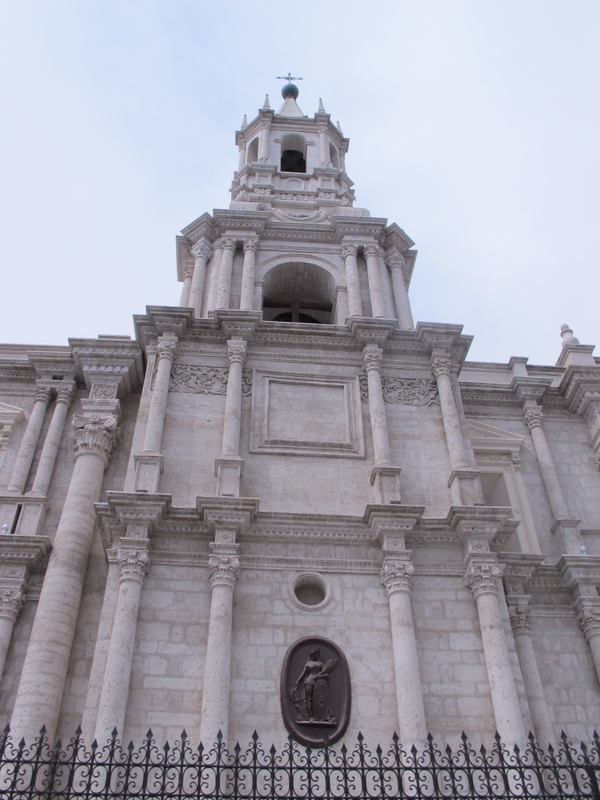 The first week in Arequipa, the white city (so named for the buildings made of white lava rock) wasn’t dreamy. The tummy pains didn’t go away for a few days, add to that a chorus of dogs that started howling at 4 am, followed by roosters, and, guess what, a festival whose fireworks set off every friggin car alarm on the street below. When it wasn’t the roosters, it was the dogs; when it wasn’t the dogs, it was the alarms. J. Murphy! For a week, I was in a sleep-deprived haze and that doesn’t bode well when crossing a Peruvian street: cars do not, repeat, do not stop for pedestrians. More than once I snapped awake to a taxi, or car (taxis outnumber people here), ready to plough into me. Seriously. Check, double check, and then gun it! Paola and Tom, and kids Nicolas and Sebastian are wonderful. 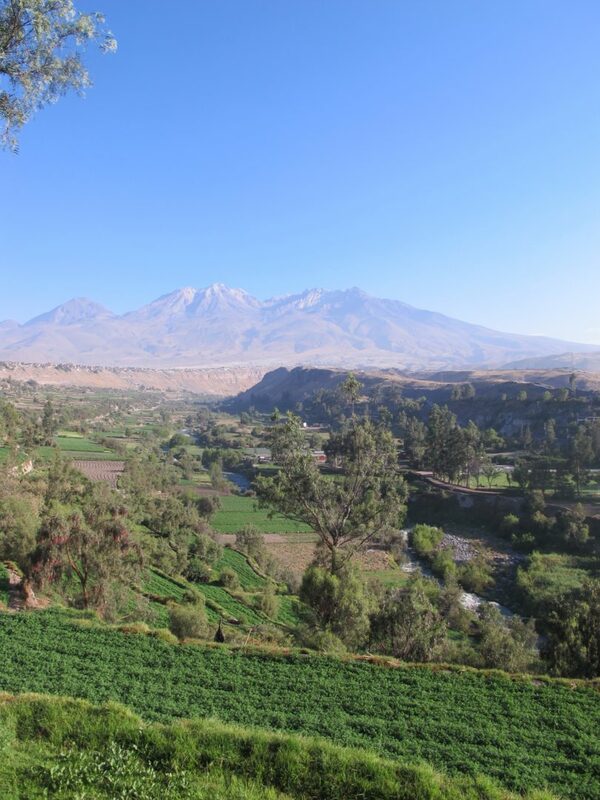 A homestay in Arequipa, I heard about it from a fellow travel writer friend Matt who stayed here a few years ago. He raved about them! Every time I come home, I get a kiss and hug. www.diazcuba.com. I don’t even get that from my regular family. Send for my things! I’m staying. 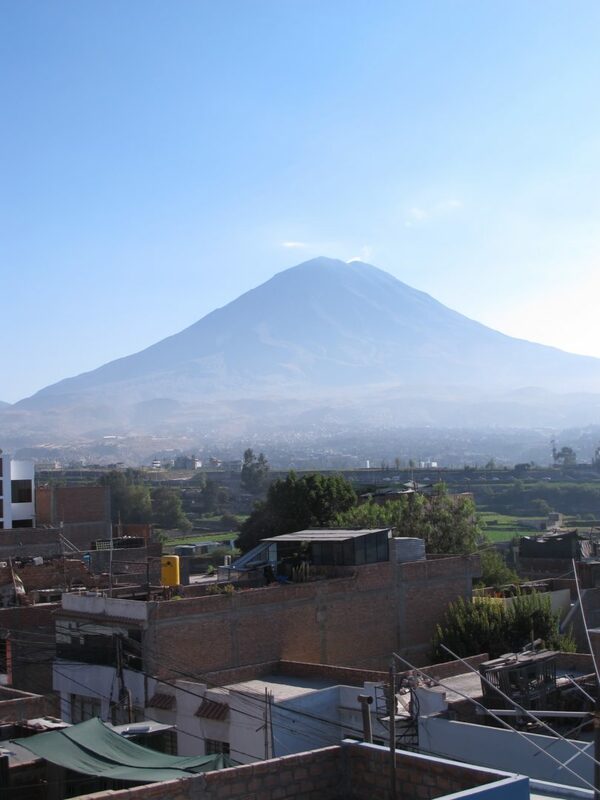 And just outside my bedroom door is a terrace that looks onto the nearby volcanos Misti, Chachani, and Pichu-Pichu… around 530 AM, it’s cool and serene–only the sound of roosters, and car alarms. Ahhh. And another reason to love it: food! Rocoto Renello, one of the most popular dishes in Arequipa, is a meat-stuffed hot red pepper smothered in cheese and sometimes served on layers of sliced potatoes. 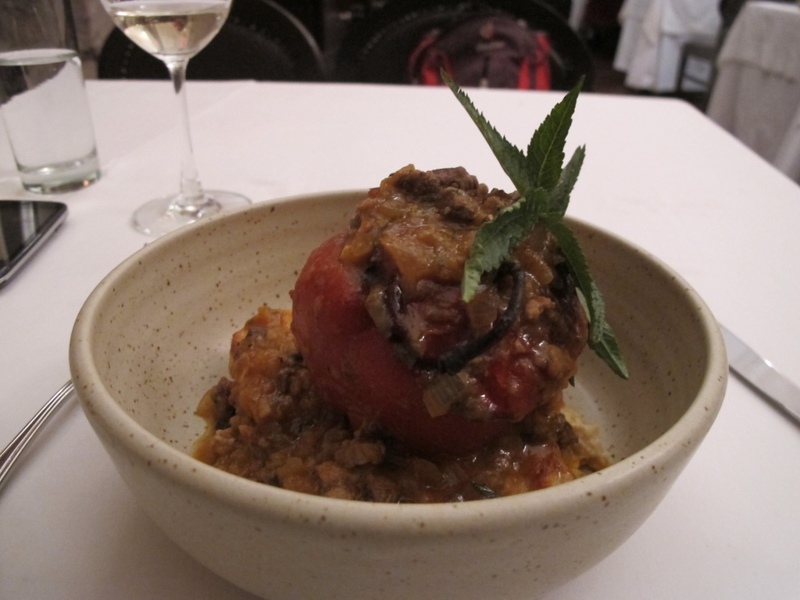 This is from Chicha, one of Gaston Acurio’s restaurants (Peru’s chef extraordinaire). And in Peru, their cheese is like feta, only it squeaks between your teeth. 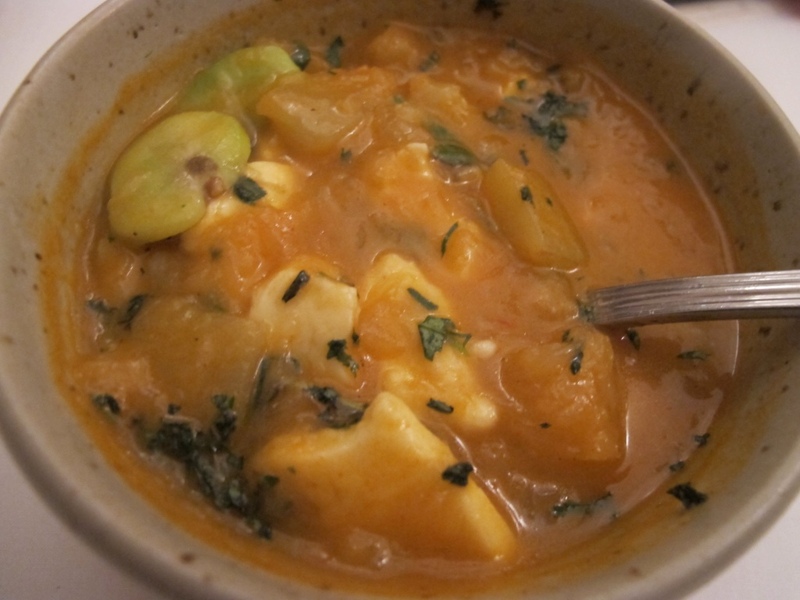 Another favourite is the pumpkin soup called LACAYOTE. Hands down the best soup I’ve ever had; broad beans, potato, huacatay herb (special to Arequipa tastes likemint, basil and rosemary–if I had to define it), with chunks of squeeky cheese. The soup tastes like you’re seven-years-old, coming inside from playing in the snow all day, your mom serves you this and tucks you in bed. That is how this soup feels and tastes. My Arequipian routine started with walking to Spanish classes in the morning with Laura–a young sprightly gal from the UK also staying with Tom and Paola–who, might I add, made it to the top of Misti, despite never, ever, hiking. I planned to add riding into the routine when my bike arrived (bought used one online in Peru). Learning and riding. Riding and learning. Walking back from class one day, I popped into Only Bikes (motorcycle and bike shop: 607 Ejercito Ave) and wouldn’t you know it, Oscar, who owns the shop with his brother and dad, invited me along with his morning posse! Woot woot, things are looking up. And then, the bike arrives! So, waking up at 5am, start riding at 6 am, we’re not on the trail for two minutes when my chain snaps. Oh well. Easy to fix. “See you tomorrow,” I say, not wanting to hold up the group’s ride. Day two: riding the same trail, the derailleur snaps. Ok, now I’m pissed. But Oscar came through, again: he called another shop for a rental and I was back in business. 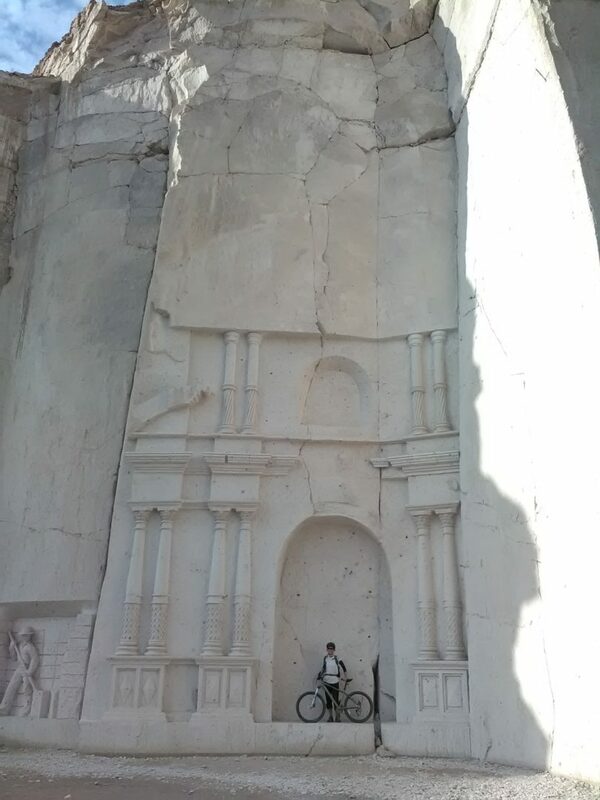 The next week, without incident, I finally rode in Arequipa. I was a bit nervous as the guys are all in their late 20’s wearing knee pads and decked out in gear; they also ride year round. Climbing along the river was easy enough, and I loved manoeuvring through throngs of people hopping on and off buses as we passed through parts of the city. Everyone starred at us as we crossed the road in single file, hopping over curbs and just being general badasses! None of the other riders spoke English, but, we already knew so much about each other. “So good? Right?” One of the older riders slides up beside me. “Si, me gusto!” I say. Can’t peel the grin off my face! 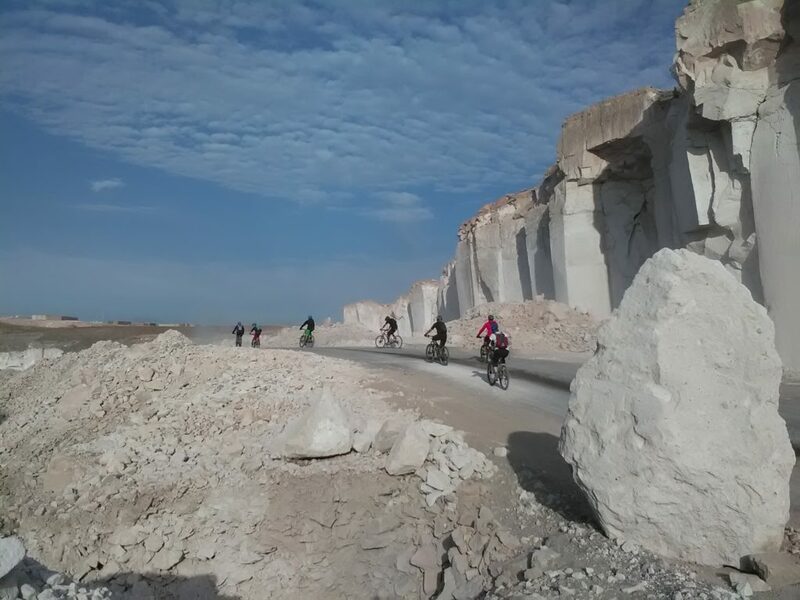 Then suddenly the ride went from good to amazing: dipping the tire down, the earth suddenly opens up and we’re riding into an expansive white rock quarry–the white is almost blinding. 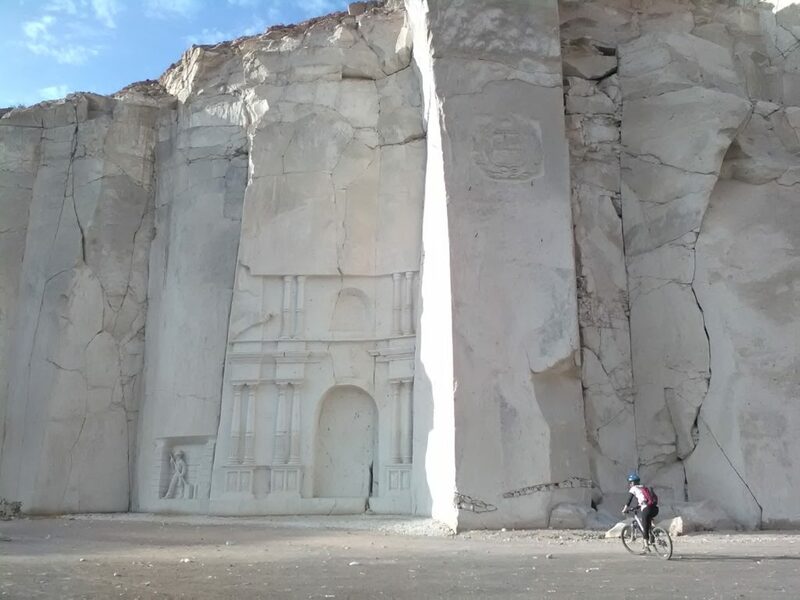 Las Canteras is the quarry where the city excavates it’s sillar, white lava rock. Then, there it is: on the left side of the white wall, two columns etched into the rock; it’s as if you could walk right into a building. It reminds me of the stones of Petra. Coincidentally, this is also the day that my friend Fran arrived. So, after feeling refreshed from riding, I got home and there she was! But, you will have to wait for those adventures. In two weeks we packed in hiking a canyon deeper than the Grand Canyon, hiring our own boat, soaking in thermal baths, dancing with locals on an island with no cars, and sleeping in a bus station and a Fred Flinstone bed. More later! Sounds amazing! But six months? I thought you were only staying for three or four. I can’t blame you, however. Enjoy! Gotta have some of that stuffed pepper and that soup! LOVE the stories. And the photos. Wanna visit. Sigh.